OPINION: Fall Fest Dance a Success? A group of students cluster around a cafeteria table, chattering unenthusiastically- a very disappointing sight to see compared to the rest of the students, who appear to be enjoying themselves, dancing like maniacs. The attire ranges from full length ball gowns to t-shirts and jeans. A group of girls decided to wear prom dresses and have a night to remember. Toward the back of the dance floor, students sit against the window ledges, just waiting for it to end. “Shake it Off” from Taylor Swift’s newest album blares throughout the room as a light showers color and patterns against the wall, emphasized by the darkness of the room. Professional lighting is supplied by the KISS 108 DJ. Green, red, and blue dots of light covered everyone’s faces, sometimes blinding. A swirl of colors, ever moving, ever changing and morphing, envelops the room. The Fall Fest dance was somewhat well received by the students who attended. 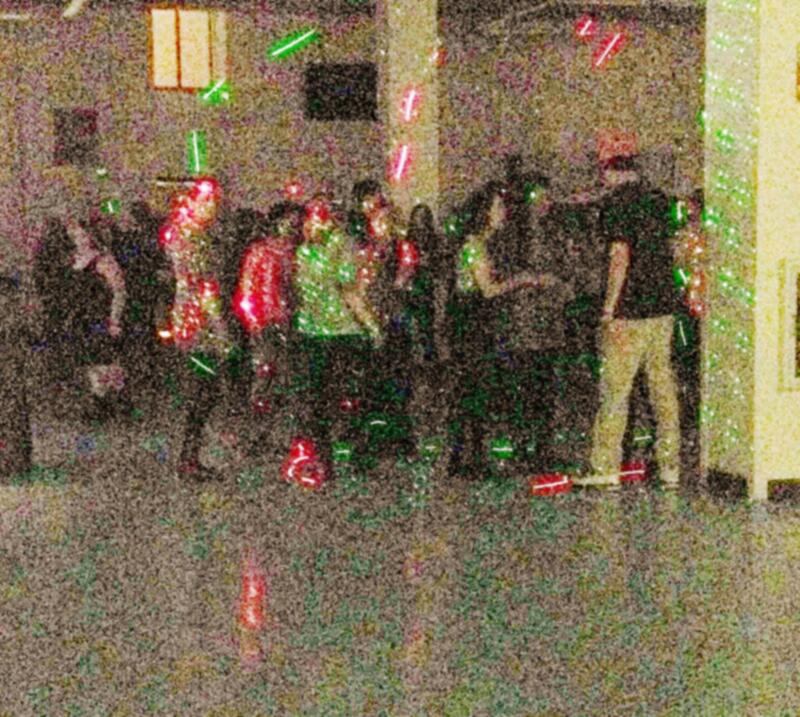 About 120 students attended the dance, which was mainly organized by the Junior Board with support from all of the other boards. There will always be people standing against the wall, hesitant to leave their comfort zone or anxious to go home. There is a border of students that is seldom crossed throughout the night, some only doing so to take a break from dancing or after being coaxed by their friends to dance. Once the dance really got started, some people began to migrate toward the dance floor; throughout the night there were the attendees that did not. All you have to do is “find some friends, get out there, and be silly,” said Jenna Kosinski, a member of the senior board. All the members of the Freshman, Sophomore, Junior and Senior Boards were required to purchase tickets for the dance. Some of the board members that felt obligated to go to the dance probably had a pessimistic attitude about the dance and were so glad when it was over and they could leave. Or maybe they just do not like dancing. Do not let those people deter you from going to the dance. If you want to have a great time, you will. It is not solely the responsibility of the members of the school boards to attend the dances; every student is accountable for enhancing school spirit. Even if you are unsure, why not go and see how it is, and then decide whether or not to go to the next dance. “One of our jobs as board of directors is to promote school spirit and community,” said Kosinski, showing the importance of all board members to attend the dance. For a couple of minutes or so after entering the dance, there was gossip about how annoying the breathalyzer policy is. To the freshmen, it is most likely a new experience, but even those who were familiar with this policy found it somewhat annoying. Although all the policies are there to protect students, and that is of great importance, it may have deterred some students from attending, according to Kenzie Boynton, a freshman on the board. Isabelle Mellor, a freshman said, “The dance was even better because of [it]. I had no safety concerns.” Mellor was coaxed into coming to the dance by her friends on the Freshman Board. Although somewhat nerve-racking, anticipating the light to change to green on the breathalyzer and feeling like it has taken a millennium to change, once over, everything is fine. It is sad that it has become necessary to implement this and other similar policies. The policies should not be revoked by any means, but it might be important to make the student body aware of their importance and the value of having them. A true success would be similar to the dances from four or five years ago, when the dances were very popular and well attended. Music filled the air and people had a great time. This energetic atmosphere can be recreated with a little help from the student body. If more people come to the dances, people will have more fun; it is as simple as that. Do not let the perception that the dances have gotten worse and are not as fun as they used to be get inside your head. It is not as bad as everyone thinks it is. If a larger percentage of the student body can accept this, dances would be much more fun for everyone. Whether or not the dance is a success is up to the students. The dance might have been a success for some, and not for others; it is all your perception. If you went and had a great time, it was a success. If hearing about the dance caused you to want to go to the next dance, it was a success. Next Next post: Dear Ruby: How Many Colleges Should I Apply To?